Synopsis: Journalist Robert Kingett accepts a dare: one that at first seems simple… to adapt to his blindness without the Internet. This account is a cozy diary of battling with an FM radio, hooking up a landline phone and the journey of adapting to a brand new way of living from someone who has never disconnected from the World Wide Web. I am suggesting this book to you all because, well, this is a fun, light, book that will delight a few readers for an afternoon or two. It is a memoir that shows how someone could take technology for granted. About the author: Robert Kingett is a journalist and author who writes and speaks about many subjects including LGBT and disability rights. His journalism work has appeared in several magazines, websites, and anthologies including but not limited to the Chicago Tribune, A&U Magazine, and The Huffington Post. 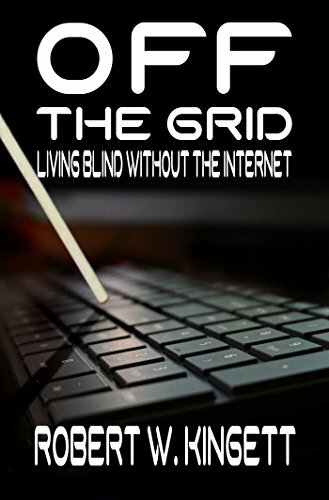 This entry was posted in Uncategorized and tagged living blind, Off the Grid, Off the Grid by Robert Kingett, Off the Grid: Living Blind Without the Internet, Off the Grid: Living Blind Without the Internet by Robert Kingett., Robert Kingett, without the internet. Bookmark the permalink. ← Do authors have a role in politics?